There's not much to say in terms of appearance. The seeker is a tall woman with tanned skin and dark hair. She wears her hair long and in whatever style suits her at the time. Her resting face is usually harsh or concentrated in expression which is emphasized by a strong jaw and angular features. However, she is not one to avoid smiling.. Her body is toned but not quite lean. Bad eating habits and all. On her body she marks herself with dye made from specially gathered bark and petals. She creates the mixture carefully and re-applies her markings almost daily. Her shoulders she leaves hand prints. For the remainder of her markings she has lines that travel down her torso and back as well as lines that wrap around her arms, thighs, and ankles. The markings hold significant spiritual value to Eyna. Eyna is typically quite pleasant in her demeanor. However, on her bad days she tends to be grumpy, stubborn, and harsh. That being said, the stubbornness typically occurs on her good days too. She is more likely to joke about her troubles or insecurities than dwell on them. She is quite private about those negative parts of her life and is not likely to speak on them seriously. She finds herself interested in conversation and other semi-intellectual pursuits. The cultures and ways of the different races fascinate her, as do the workings of the Spirits in the world. She is extremely reverent of the Spirits and that goes beyond simply Bear, Wolf, Raven, and Snow Leopard. It even goes beyond the Spirits that were lost in the Norn people's journey south. She often meditates and communes with the spirits of nature as well as the traditional Norn pantheon. Typically she dislikes or judges those who would rush into a situation before thinking it through which makes it difficult sometimes when interacting with other Norn, however she tries to look past what she sees as foolishness for the sake of friendship. This doesn't always work due to her stubborn nature. She could be accused of lacking passion and laziness and the accusers would not be far off. She simply keeps to herself (often times too much) in terms of emotions and would prefer to save her energy unless it's necessary to get up. For someone of her age Eyna is newly coming into her Magic. It's always been there, she was just either ignoring it or in denial. The abilities that she has from magic aren't terribly spectacular or even useful in most cases. They allow her a heightened perception of the spirits (of nature) and the ability to commune with them. She is able to bond with animals (one or two at a time) which lets her have an awareness of what they are experiencing as well as lets her communicate simple commands through that bond. These abilities may grow as she uses them more. 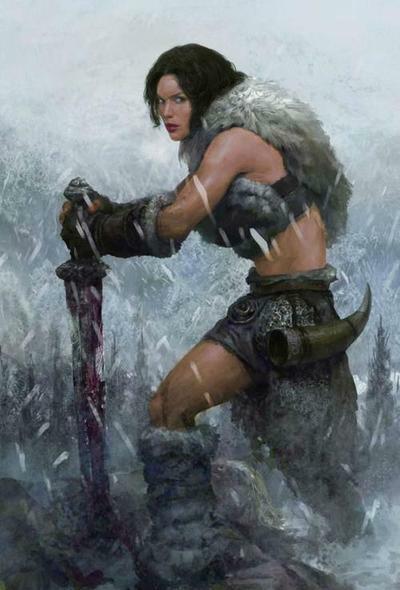 In terms of combat abilities Eyna favors the staff, though she is also proficient with a one-handed axe or set of daggers. Most items she typically uses as melee weapons, favoring to hit enemies over the head (or chop them over the head depending on the day) over fighting from a distance. With all that being said, she usually avoids combat in the first place. Physically she is quite strong, like most Norn. She is able to lift heavy objects, has a decent amount of endurance, and has a high body temperature meaning she can last in conditions not suitable for other races. The VERY FIRST screenshot ever taken of Eyna (around 5 or 6 years ago?). Behold. In-game Eyna is a ranger - soulbeast or druid depending on my mood. This is my first time playing her with magical abilities so I'm using very basic versions of what her class can do and hope to expand that as I RP. If you're thinking, "Hey this person is a copy cat! I've seen this bio before!" you're probably right. This is a remake since my original bio for this character was on a different account and was deleted. Also I lost the original version. Whoops. But this is the real and original Eyna! For much of her past Eyna traveled to different areas and wrote scrolls that categorized and reflected on the teachings of different races. I recently found those old scrolls and will keep them cataloged here! Several years ago Eyna ventured to the Grove, having been convinced that seventeen years was enough time seeking her wisdom and knowledge up north. After some thought she decided on the center of Sylvari culture as her first destination. Upon arriving she sat for a meal with a friendly man of leaves who was more than willing to share with her the teachings of his people. He spoke them aloud and a few hours later Eyna put them to paper. This is her translation, with additional notes from her conversation with Ravensight. The text is written in clumsy handwriting on a scroll of hide, housed in a container made for her by her father from a dolyak horn. For the sake of the clarity of this post, edits that Eyna makes to the scroll while meditating with Wolf will be added in green, edits with Bear will be made with red, edits with Raven will be made with purple, and edits with snow leopard will be made with blue. Live life well and fully. Waste nothing. Do your part, maintain balance. Life spent with your pack is a good life. Do not throw away what can be shared. Be strong throughout your life. Do not waste your strength on things that do not matter. Absorb all you can throughout life. Do not leave a single seed of knowledge un-nurtured. Live for yourself. Do not waste what could be used for your benefit. Do not fear difficulty. Hard ground will mean strong roots. Our deeds make us what we are. The more difficulty we face, the stronger we become. Difficulty will bring the pack together, strengthening the bonds of loyalty. Your strength can only grow. Use adversity to your advantage. Do not shy from the difficult problems. Your intellect will only grow. Laugh in the face of difficulty. The only lasting peace is peace of your own soul. Find the quiet within. Only you can say who and what you are. You cannot help the pack if you cannot help yourself. You must rely on yourself. Find your inner strength. Be at peace with yourself. A clouded mind will always return to haunt you. You are independent. You must learn to be at peace with yourself. All things have a right to grow. (Live). Even Dragon has a place. His malice makes us stronger. Without life there is nothing for the pack to hunt. You must let others find their own strength and fortitude. You have no right to decide when it is time for someone or something to go to the Underworld. That is Ravens' duty. You are your own person, as is the person next to you. Do not interfere in that. Never let a wrong to ripen to evil or sorrow. Either kill your foes or forgive them. Don't let your emotions cripple you. A wrong done by one of your pack left to fester will eventually tear the pack apart. True strength is not letting adversity destroy you. A bad seed left to fester will only slow the mind. Letting a wrong destroy you is letting your defenses down. Don't rush into something, but don't sit back and do nothing. Do not bring ill upon your pack by acting dumbly or by not doing anything. Your strength is useless if used without thought or not used at all. Use ravens' wit, always. But do not merely sit and ponder. Planning is key but you must follow through. Where life goes, so should you. Follow the path to your potential. Track your prey, follow it diligently. Where life is for others so lies life for you. The path lies before you. Walk it. 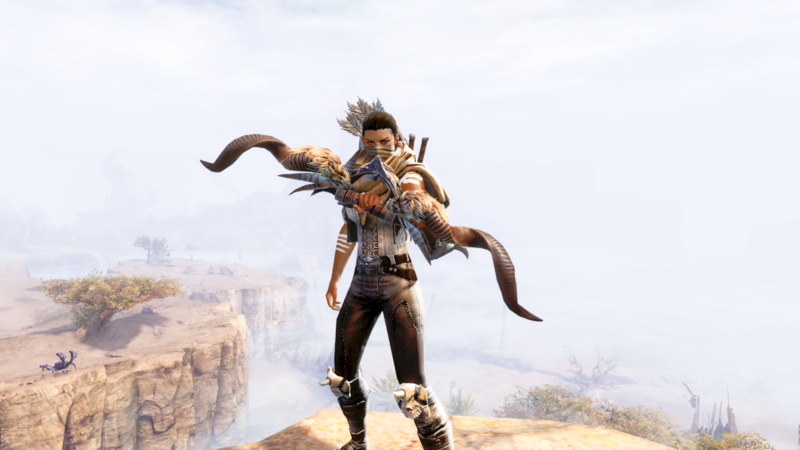 Several years ago Eyna first traveled to Ascalon to learn more about the Charr. Though not as welcoming as the Sylvari were Eyna asked multiple questions of multiple furballs until sufficient answers were received. Upon returning to Hoelbrak she plopped down in Raven lodge to write down what she remembered on a fresh scroll of hide. Again, edits made while meditating with Wolf will be green, Bear will be red, Raven will be purple, and Snow Leopard will be blue. The charr have many differences from my people, but with these observations I am determined to find the similarities between us and put their wisdom to words. The Charr fight in warbands, a quality Wolf would smile upon. These craftsmen are the builders of their people. When asked, one described their legion as inquisitive with a keenness on solving problems. This is something I can respect. Both traits listed are ones that Raven would be proud of. This is the legion that builds most, if not all, of the great works of metal seen in their capital. Their crafts are not those that would be made by those of Raven though. I find it difficult to take lessons from these Charr. I will meditate on them more with each of the spirits. These soldiers of blood are the ones who take up arms for their people, the soldiers of the front line. They describe themselves as being straight forward, liking to face things head-on. These are ideals that Bear would smile upon. They are said to fight best in close quarters and those who have fought them and lived to tell the tale have said that they are very hard to defeat. Yes, Bear definitely smiles on them. Strength and fortitude. Still, I will need further time to reflect on this legion. Those who remain in the shadows are those that make up this legion. They speak of the best solutions being the quickest and the quietest. Snow Leopard is the Spirit that comes to mind for this legion, though they do not revere the great Spirits of the wild as we do. Tacticians, scouts, and spies they are. They possess the strategic gift of Snow Leopard. Yet again I struggle to find the lessons within these legions.